It you’re not allergic to down, there’s no question that down pillows are among the most comfortable options out there to sleep on. It’s sort of like your head sinks down into a fluffy cloud the moment you lie down — at least, that’s what it’s like if you have a good quality down pillow. If you’re looking for quality without the cost, Amazon has a killer deal of the day on Tuesday that you’ll definitely want to check out. Popular brand eLuxurySupply’s Extra Soft Down Filled Pillows are discounted today if you buy a 2-pack, and that includes Standard, Queen, and King sizes. You’ll save as much as $67 if you pick up a 2-pack today, so definitely check out the sale. MATERIAL – Durable 230 TC Cambric Woven 100% Cotton Casing is the perfect blend of softness and durability. The filling is composed of a 80% down/20% feather blend designed specifically for stomach sleepers. 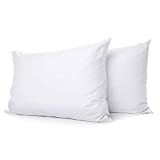 SIZE & FILL SPECS – Queen Size 20 x 30 | 525 Fill Power White Duck Down is less than a traditional back/side sleeper pillow of 600 | Cotton casing weave is tight enough to avoid poking of feathers yet allows pillow to breathe. CARE INSTRUCTION – Easy Care Machine Washable & Dryable. Be sure to throw your pillow in the dryer for 10 minutes to give it a good fluffing once a month. GUARANTEE – Customer satisfaction is our top priority which is why we offer a money back guarantee if you are not 100% satisfied with your purchase. For all returns within the 30 day return period, eLuxurySupply will provide a prepaid return label for a completely free return.